Jhanvi was gazing at the roof with bleared visage. She was just 21. How would a girl,with so many aspirations and passion in her heart ,feel when suddenly one day she gets the news that both her kidneys have failed? Jhanvi was going through the same pain. Not only that, but her 1 year old marriage was also at stake now. None of her in-laws were there with her..not even her husband when she needed him the most. “I will never leave you what come may. I would be your pillar of strength”, she murmured to herself the words which had been said to her on the first day of their marriage. “Ha! It was all fake. Everyone is selfish in this world. Not everyone passes the test of time.” She winced and looked at the catheter tube which carried blood from her vein to the dialysis machine for purification. She turned her head to the other side. She just could not bear this sight. To her left, her mother was sitting on a chair. Tired, tense, sad, still having a dull smile on her face. Jhanvi knew this smile was put up just for her, to make her feel good. “Because you are destined to do something extra ordinary”, a voice came from her right. Jhanvi turned to see a young charming lady standing at the door with a charismatic smile. Jhanvi closed her eyes and gave a pained smile. “Hmm.. just one more hour and your dialysis is done” Dr. Rama said. The ringtone of the phone distracted Jhanvi from her musings. She looked at the phone. An unknown number. She looked at the clock beside her. It was 2:00 p.m.
She put the phone down with a smile on her face. It was a placid one. She took her phone and messaged Dr. Rama. Thank you Dr. Really… Normal is overrated. This is absolutely beautiful!! What an encouraging, inspiring, and life giving read. Thank you for sharing! This is so beautiful! I love your writing style! This is a motivating and good approach towards life. You are right even I think being normal is overrated. However, you have a good writing style. Way to go. This is such a lovely and inspirational story. I totally agree that normal is overrated and we are all meant to shine and be extraordinary. This made me emotional, in life we face so many difficulties and end up thinking that we will not be able to make it but if we put our minds to it and believe in ourselves everything goes just the way we imagined it. We create our reality. I just love this! I always tell my kids to be weird. Normal is boring and dull. Who wants that? Such motivation. All I need is a constant consistent bout of this feeling to achieve things greater than my own will! Sometimes we need a reminder of how strong we are and what we can achieve. When we are sick and in pain it’s hard to think positive unfortunately. Thank you for sharing this beautiful story – I could feel her heartache when she was on dialysis; what an inspiration Doctor she had! I’m so happy it all turned out well! Sometimes things look really big when you are going through it. Once you are past it and look back, it may not look that bad! Lovely write up. I enjoyed and appreciated your short story (or is it real life?). Sometimes there is a moment that is the tipping point that leads to the change that you want and need in your life. Just a little nudge in the right direction. And it is always good to remember where that nudge came from to give it the recognition and appreciation it deserves. This is very inspiring, yes sometimes we forget that we are stronger than we think and can face anything that is infront of us. But there are times when you are going to difficulties in life, it feel like the world just stop and there is nowhere else to go. Great post here and very inspiring to everyone. Wow, what an awesome read! It was beautifully written, and I love the message. I even put the quotes on my notes already, “You are bigger than your problems. 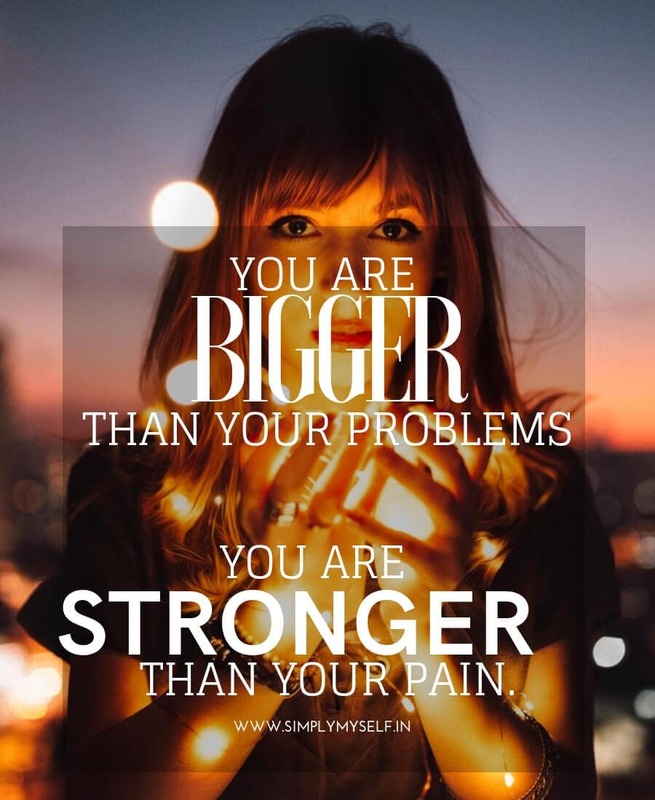 You are much stronger than your pain”. Thank you for sharing this! This is so so inspiring. Thanks for sharing this story and motivate us to keep a positive attitude. What an inspiring article. I couldn’t agree more on this. Indeed, we are greater that our worries and fears. Definitely we can surpass everything. Such a positive and beautiful story that you put out there. There are so many negative stories, it’s good to hear some positive ones out there. We need more of them. This is so inspiring. You have an in-depth knowledge about this topic my friend. This shows in your work loud and clear. What a positive post. This quote resonated with me and it was powerful thank you for the strong reminder. This is very inspiring and I absolutely love the quote on your title! Just goes to show us that we should strive to be extraordinary just as we are destined. Exactly and well said. We need to teach our kids there is no such thing as normal and they should strive to be different– uniqueness should be valued. Beautiful post. I believe that God is always there and he doesn’t put as in a place where his Grace cannot reach us. I have always been considered a little “extra”. Its the Aquarian in me!